At Chicago Industrial Equipment, our goal is to provide the best heavy equipment solutions to customers in the Chicago area and beyond. That’s why we only offer products from the most reputable manufacturers in the industry. Whether you need a high-quality new or used aerial lift platform or earthmoving machine at a fair price, you’ve come to the right place! Our extensive equipment inventory includes new and used products from Gehl. Since its humble beginnings as a small blacksmith shop more than 150 years ago, Gehl has grown to become a leading provider of compact heavy equipment for industrial use. Chicago Industrial is proud to offer the latest Gehl telescopic handlers and skid steer loaders for sale. Like all new Gehl equipment, new Gehl skid steer loaders and telehandlers include a variety of innovative features that will increase your productivity and reduce your operating expenses. RS Series: The RS Series consists of more than a dozen models with a rated lift capacity ranging from 5,000 to 12,000 pounds and lift heights of up to 55 feet. The rear axle stabilization provides the additional stability required when raising the boom to 60 degrees. Outriggers are also included to increase stability when raising the boom to its full height. The internal wet disc brakes ensure safe, reliable stopping of the machine. DL Series: The Gehl DL Series features the ultimate combination of high lift, extended reach and superior load capacity. They are also designed to maximize visibility and comfort to help keep operators safe and productive from the beginning of their shift to the end. Choose from a half dozen models with load capacities from 7,000 to 12,000 pounds and lift heights from 40 to 55 feet. The 115-horsepower turbocharged engine couples robust power and performance with emissions compliance. A number of optional attachments are also available to increase your machine’s versatility. Radial-Lift Skid Loaders: New Gehl radial-lift skid steers are designed to provide maxim reach at the middle of the lift height, making them perfect for applications such as loading flatbed trucks and dumping materials over walls. They are also an excellent choice for grading, excavating and digging beneath grades. Choose from 10 radial-lift skid loaders with a rated operator capacity ranging from 1,350 to 2,600 pounds and net power ratings from 44.5 to 70.7 horsepower. Vertical-Lift Skid Loaders: Gehl vertical-lift skid loaders offer the ultimate in innovation and performance. As a full-size skid loader designed for maximum power, you can choose a machine with a rated load capacity of up to 4,000 pounds. Available features include state-of-the-art T-bar controls that make the machine extremely user-friendly, as well as a high-strength, low-profile, heavy-duty boom that lifts loads in a true vertical path. The unique cab-forward design includes a fully adjustable operator area that operators can customize to achieve the desired comfort level. If yours is like many companies that are looking for ways to economize, you will want to take a close look at our selection of top-quality used Gehl equipment. 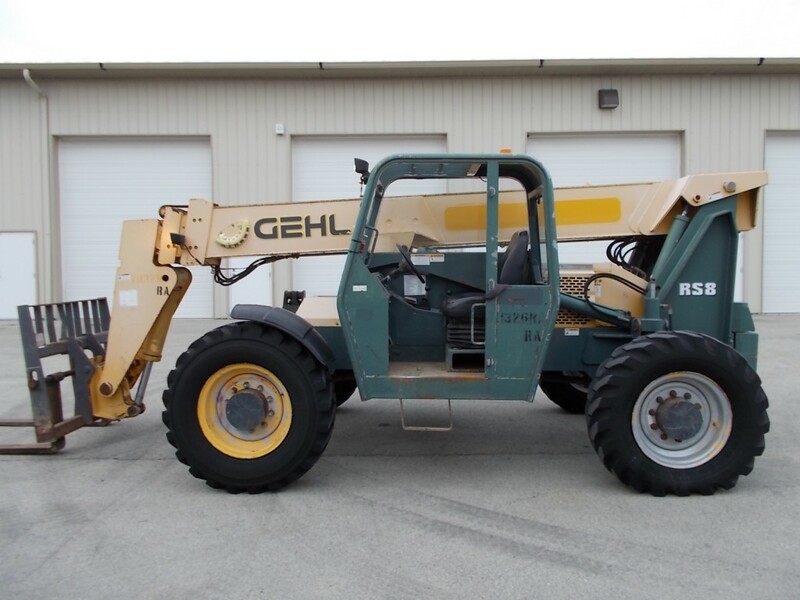 We offer used Gehl skid steer loaders and used Gehl telehandlers that have been expertly restored to like-new condition. Purchasing used Gehl skid loaders or telehandlers provides a cost-effective alternative to buying a brand-new machine. You can save thousands of dollars while sacrificing little in terms of reliability and performance. Buying used Gehl equipment also gives you maximum flexibility to choose a machine that meets your needs and budget requirements. A newer model will include many of the advanced features that will enhance your productivity, while older units often provide the best long-term value for your money. If your company frequently rents telehandlers or skid steer loaders, you may also discover that buying a used machine will actually save you money over the long haul. What’s more, buying used instead of new frees up additional capital you can use to grow your business. Buying used equipment sometimes involves a bigger risk than when purchasing a brand-new product. At Chicago Industrial, we strive to give our customers access to all the information they need to make a sound purchasing decision. You can learn a great deal about our used Gehl equipment by reviewing the individual product descriptions. Our experienced staff is also available to answer your questions about any of our used machines for sale. If you are looking to pay for your new or used Gehl equipment over time, Chicago Industrial can help. Our long-term relationship with Direct Capital can assist you in accessing flexible financing options that will make your equipment purchase more affordable. Direct Capital specializes in making lending arrangements with small- and mid-sized companies of all types. The 24-hour application turnaround time ensures qualified borrowers won’t have to wait long to receive their funding. Don’t let excessively high shipping costs prevent you from enjoying the many benefits of Gehl equipment. Our centralized Chicago-area location ensures affordable shipping rates for companies throughout the U.S. We also work with multiple trucking companies to secure the best possible freight rate for our customers, whether your business is based in New York, California or anywhere in between. Whether new Gehl skid steer loaders or telehandlers or top-quality used Gehl equipment meets your requirements, you will find the right solution at Chicago Industrial Equipment. You can view our latest Gehl offerings by visiting our current online inventory. You can also contact us for additional product and pricing information. Discover what makes Chicago Industrial your best choice for superior aerial lift and earthmoving equipment in Chicago and beyond!